Your donation will help Canadians across the country (and beyond) to step outside, get familiar with wildlife and engage in the natural world. Delivering programs to inspire conservation ethic for all and offering training that connects people with wildlife and nature through experiential learning. To Whom Are You Giving This Gift In Honour? Yes! I’d like to hear more from the Canadian Wildlife Federation, Canada’s largest supporter-based wildlife conservation charity. By joining CWF's online community, I will receive wildlife and conservation updates, special features and exclusive e-mail offers for free! I know that I can unsubscribe at any time.Don’t worry, CWF DOES NOT SELL, TRADE, or LEASE personal information without express written consent. CWF values your privacy. If you would like more information, please contact us. At the Canadian Wildlife Federation, our singular mission is to conserve and inspire the conservation of Canada’s wildlife and habitats for the use and enjoyment of all. We thank you for your support in helping us make wildlife wishes come true as we work to help #ConserveTheWonder. Your full tax receipt will be e-mailed to you within 24 hours. It’s perfect as a gift or to remind yourself how you chose to impact conservation in Canada. Click here to download your free certificate and customize it for your recipient. 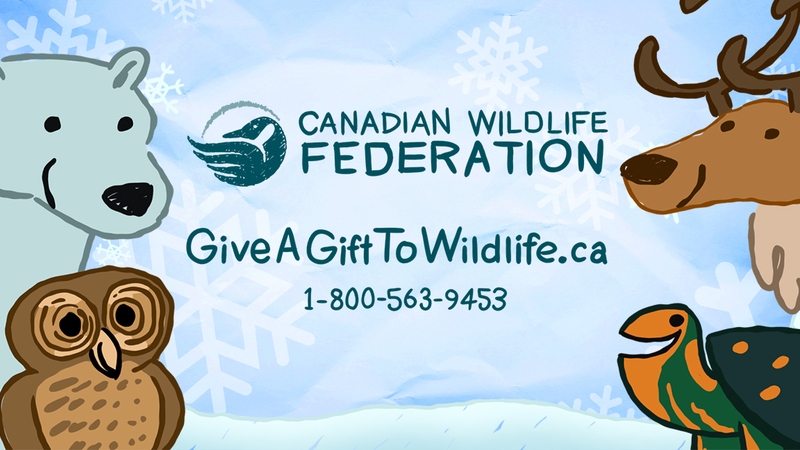 Have a happy and safe holiday and thank you again for supporting the Canadian Wildlife Federation.